#Tumhen Dil Lagi is the latest track sung by famous #Artist #Shafaullah Khan Rokhri and produced by #Rokhri Productions whereas Digital Distribution is done by #MobiTising. 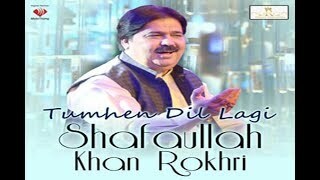 #Shafaullah Khan Rokhri is among the #Top #Singers of this #region with #beautiful #melodious #voice, he possess strong command over numerous #languages such as #Urdu, #Punjabi and #Siraiki. #Sochta Hoon Ke is another master piece of #Shafaullah Khan Rokhri sung in #Urdu language, #Shafaullah Khan Rokhri has explained the situation of a #heartbroken person and how one feels after being separated from his #loved one due to his #fate, this #song #Sochta Hoon Ke will successfully make a #mark in everyone’s #heart with #lyrics and #melodious #voice. Listening to this #content will not only elevate your #feelings but will also rejoice your #mood. Listen to this #beautiful #content and share it with your #loved ones as well.